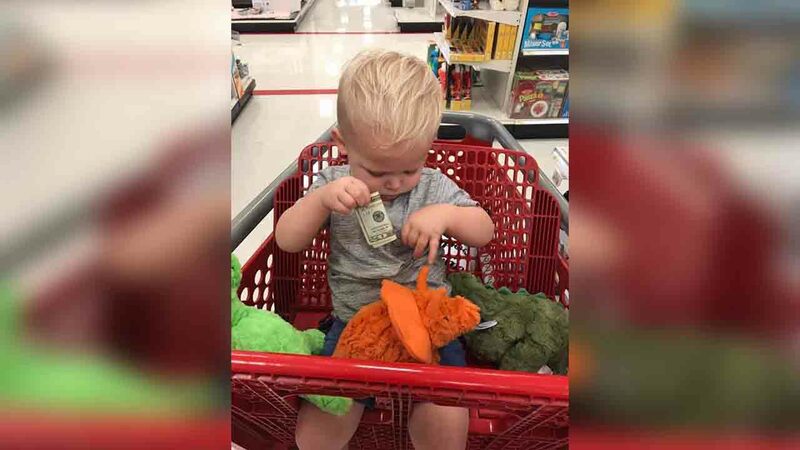 COWETA, Oklahoma -- An Oklahoma woman was left crying "in the middle of Target" after a stranger did something incredibly sweet - pulled $20 out of his wallet to help purchase toys for her son. According to WGHP, Alyssa Hacker was waiting on "Grammi" inside Target when her 18-month-old son Owen grabbed three dinosaur toys. "We were trying to pick out which one he wanted when Owen abruptly yelled 'Hi' at this older man walking past us," Hacker wrote in a Facebook post. "He turned around and said, 'Hey sweet boy.'" As Owen continued to play with the toys, the man got $20 out of his wallet, put it in the little boy's shirt pocket and said, "I just lost my 2-year-old grandson last week. You take this money and buy this boy all three dinosaurs." He then rubbed Owen's back, wiped away his tears, and walked off. Hacker said she's grateful to know there's "still some good in this world." Her post has more than 320,000 likes and 122,000 shares.